David McKenzie (right), 40, of Bangor signs a petition for a 2016 referendum question to allow a casino in York County on Wednesday outside the garage at Pickering Square in Bangor. "I think it's a good idea," he said. "It brings in money. And -- I don't know how else to say this -- I like gambling." BANGOR, Maine — A group linked to a controversial Las Vegas developer is working to complete a furious — and apparently expensive — signature-gathering effort to convince Maine voters to hand him rights to a York County casino via a 2016 referendum. 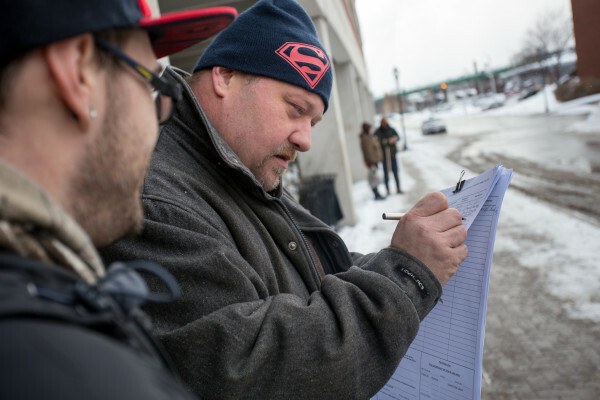 That campaign is drawing attention in Bangor, where a city councilor has accused petitioners of misleading tactics and a University of Maine political scientist says someone trying to recruit students told him it would pay gatherers $10 per signature or more. It’s an enormous effort that has ramped up over less than a month: Horseracing Jobs Fairness, a ballot question committee, registered with the state in December, when it reported $28,000 in contributions from a woman named in media reports as the sister of casino developer Shawn Scott. “Maine people don’t like that when it happens,” he said. This isn’t Scott’s first foray in Maine: He bought the Bangor Raceway, then bankrolled a 2003 campaign to allow slot machines there, eventually selling his operations to the current operator of Hollywood Casino for a $51 million windfall. He was the subject of a damning 2003 report from the Maine Harness Racing Commission that accused him of having a web of companies demonstrating “sloppy, if not irresponsible financial management.” The report linked Scott to 37 lawsuits in four states between 1992 and 2000. He was sued by Scarborough Downs in 2005 for allegedly undermining public support for slots there. Scott and his associates are the only such developers, said Linwood Higgins, a lobbyist for the Maine Harness Horsemen’s Association. If approved, the York County operation would be Maine’s third casino, joining others in Bangor and Oxford. The state would get 39 percent of slot machine revenue and 16 percent of table game revenue, with money going to public K-12 and higher education as well as other state and local causes. Those public benefits have made it into talking points used by individuals trying to gather the more than 61,000 signatures of Maine voters by Feb. 1 to place the proposal on the November ballot. On Wednesday, Ralph Tripp of Bangor got passers-by to sign his petition by saying little more than it would support a new casino. He told a reporter that schools need more funding and the proposal was about “uplifting the spirits of the people of Bangor,” without mentioning that the casino he was boosting would likely be more than 120 miles away. Bangor also is likely to be a bastion of opposition to a new casino: Hollywood Casino opposed the 2010 campaign for the Oxford casino. On Monday, City Councilor Ben Sprague said via Facebook that he was approached by someone asking him to support “using casino revenue to fund education in Maine,” and when he asked if it was to support a York County casino, the man didn’t give a straight answer and walked away when Sprague asked to see the text of the proposal. Kristen Muszynski, a spokeswoman for Secretary of State Matthew Dunlap, said the office has received complaints of “misleading tactics,” but she said that false claims are constitutionally protected free speech, and it’s a voter’s responsibility to ask a gatherer for the text of the proposal. Sprague, a casino opponent, called the efforts dishonest and over the top. University of Maine political scientist Robert Glover said that he was approached in his office on Tuesday by an employee of the campaign who told him that he wanted to recruit students who would be paid upward of $10 per signature. That’s a massive amount, likely indicating the campaign’s time crunch: Gatherers were paid $2 per signature during the failed 2014 campaign to ban methods of bear hunting. The committee’s December financial report said that it paid $6,000 to Olympic Consulting, which is run by former Republican legislator Stavros Mendros of Lewiston and collects signatures for Maine campaigns. Most of the campaign’s action has gone on since then, and another report is due to the Maine Ethics Commission on Friday. Mendros said he was “ridiculously busy” and couldn’t comment on Wednesday. Cheryl Timberlake, an Augusta lobbyist named as the campaign’s treasurer, didn’t respond to requests for comment. The casino bid comes as the Legislature is still considering a bill sponsored last year by Rep. Wayne Parry, R-Arundel, that would allow a casino in either Cumberland or York counties. It’s supported by the horsemen’s association, but it would take a drastically different path than the referendum, requiring a bid process and an initial investment of $250 million. Higgins said his group could endorse the referendum, but that its bill is better. “I think it’s good public policy to have the Legislature endorse any change in the law as opposed to an outside business that has written a law to their interest as opposed to the best public policy for the state,” he said. 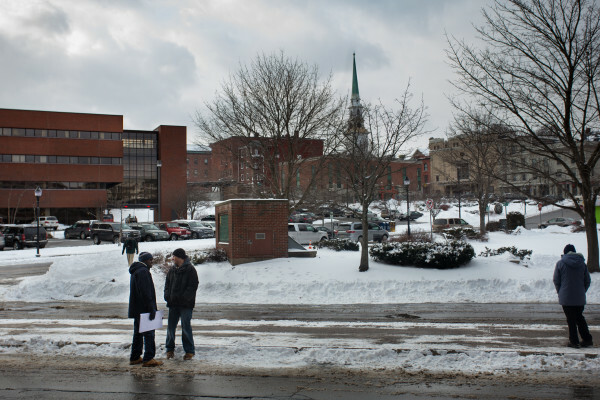 Bangor Daily News visuals journalist Micky Bedell contributed to this report.